Boil the potatoes and carrots in salted water for approx. 15 mins. until soft. Drain the water, allow the residual moisture on the potatoes and carrots to evaporate by shaking the pan on the switched-off hob until the potatoes are dry and whitish in colour. Push through a sieve, allow to cool a little. Mix in the flour and quark. Add the egg, season and mix well by hand. The mixture should still be moist but no longer stick to your hands. Add a little more flour if necessary. On a lightly floured surface, shape the dough into 4 rolls (each approx. 2 cm in diameter). Cut the rolls into pieces approx. 2 cm long. Place the gnocchi on a floured towel. Preheat the oven to 60°C, warm the platter and plates. Cook the gnocchi in batches in gently simmering salted water for approx. 5 mins. until they float to the surface. Remove with a slotted spoon, drain, transfer to the warmed platter, add the oil and keep warm. Bring the cream and water to the boil with the gorgonzola, season. Add the spinach, allow to wilt. 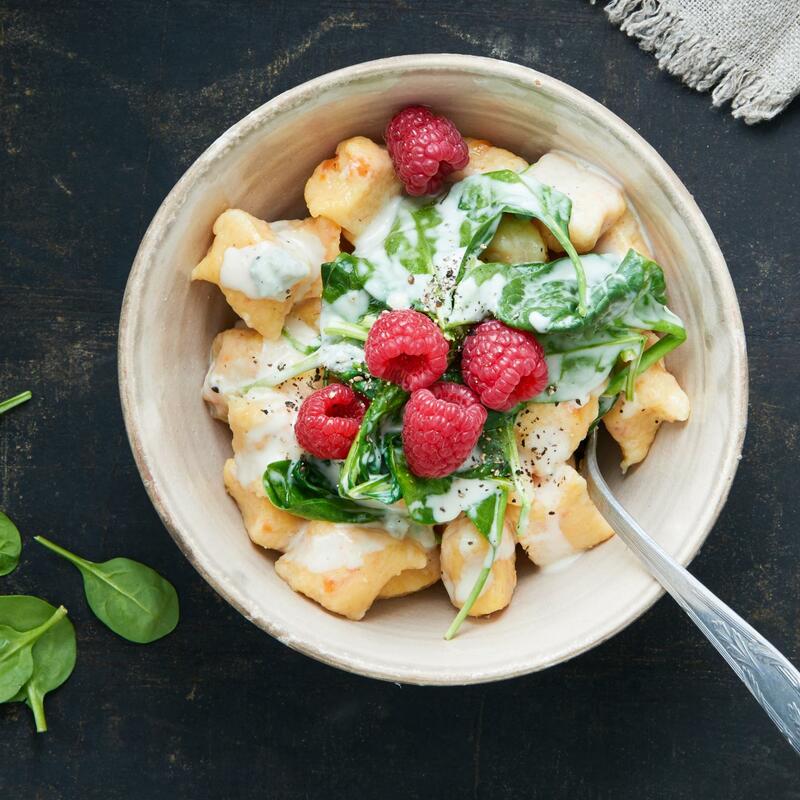 Plate up the gnocchi, serve the sauce on top, sprinkle with the raspberries.